This 3rd generation of the Nest Learning Thermostat is ideal for anyone who simply wants more convenient home heating. The smart thermostat programs itself based on your habits and automatically switches into 'Eco Mode' when it senses that nobody is home. You can also manually change the temperature at any time on your phone, tablet or desktop (including when you're away from home). It's even possible to raise or lower the temperature using the Google Home or Amazon Alexa home assistants. See it from across the room: The Nest Learning Thermostat 3rd generation has a display that can be read even from the other side of the room. 'Farsight' detects your presence and automatically switches the screen on when you enter. Teaches itself: The smart thermostat tracks your manual inputs during the first week of use, automatically generating a schedule based on your daily routine. You can view and manually edit this schedule within the Nest app. Straight from your hand: You can manually control the Nest Learning Thermostat using your phone, tablet or desktop. You can even change the temperature when you're not at home. See what's happening: Ever wonder how you manage to pay so much for your heating bill? The Nest Thermostat creates detailed daily and monthly reports on energy usage. Eco Mode: Nest's 'Eco Mode' is the main way in which it saves you money. Anytime it senses that you're not at home (either via the schedule or geofencing), it automatically switches your home heating into this low-energy mode. One of the only smart thermostats on the market that actually teaches itself when to raise and lower the temperature. 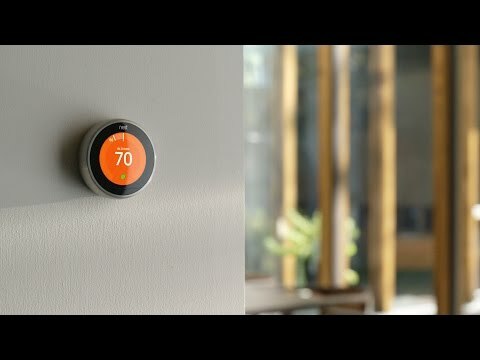 The 3rd Generation of the Nest Thermostat tracks your manual inputs during the first week of use, generating a heating schedule built around you. Nest has designed their products to work seamlessly with one another and owners of the Nest Protect will unlock a special feature that could be a life-saver. Heating systems can often be the source of excess carbon monoxide in the home. If the Nest Protect senses elevated levels it commands the Nest Learning Thermostat to switch off the heating, preventing a further increase in CO levels. Keeping in tune with the rest of its ultra-smart image, the Nest Thermostat can also be controlled using the Google Home and Amazon Alexa home assistants. You can ask either of these to raise or lower the temperature using only your voice. Nest has included a manual which takes you through the process. You'll have to remove your old thermostat, which may require you to hire an electrician (depending on your level of DIY experience). It comes equipped with temperature and humidity sensors, as well as near-field and far-field detection sensors. The device is powered using a rechargeable lithium-ion battery. You'll be prompted to download the Nest App during setup. It uses an intuitive disc design to change the temperature, just like a physical thermostat. A thermostat which automatically programs itself to function based on your routine. It uses a combination of scheduling and Eco Mode to lower your energy bill. The thermostat uses Wi-Fi to connect your smart home (being capable of using both the 2.4 and 5 GHz bands). You can also control the temperature of your thermostat remotely. A stunning design. You have four different ring colors to choose from, so you'll find the right design to fit your home. The thermostat has a 24-bit color LCD display that's simply crystal clear. As the Nest Thermostat uses your Wi-Fi network to communicate with your other devices, a strong network password is the best way to keep your data safe. Great for anyone looking to cut down on their energy bill - the thermostat basically pays for itself over time. Also ideal for anyone looking for more convenient home heating. How many Nest Learning Thermostats can I use in my home? You can use up to 20 Nest Learning Thermostats in one home. Which heating systems is the Nest Learning Thermostat compatible with? How is the Nest Learning Thermostat powered? The thermostat is powered using a rechargeable lithium ion battery.